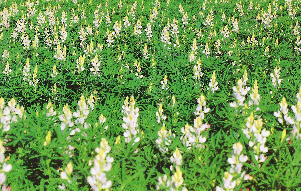 Cultivated annual lupins (L. ALBUS L., L. ANGUSTIFOLIUS L. and L. LUTEUS L.) represent the group of crops that have retained very close links with their wild-growing ancestors up to the present moment. Such species have acquired their “cultigenic” status only partially; in the remaining part they preserve their typical structure and have typically large regional ecotypes, sometimes corresponding to subspecies. The characters of their seed, flowers and vegetative organs demonstrate similar parallel series of variation. Therefore, we describe their varieties in a definite sequence: firstly, the “wild” type, with motley seed and intensely coloured flowers; secondly, the less coloured series; and finally, the one with white seed and flowers. 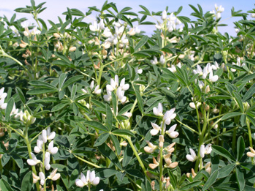 Subordinate to varieties are subvarieties and forms. Each variety encompasses both cultivated and wild-growing forms, since the differences between them are only quantitative. 1. All flowers within inflorescences are whorled, fully vertillate. The corolla is yellow and fragrant. 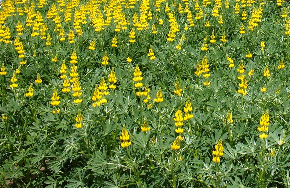 Mainly W. Mediterranean, elsewhere cultivated and naturalized. ..................… L. luteus L.
+ Only middle and upper flowers are whorled; the lower ones are alternate. The corolla is blue, violet, pink or white, and odourless . …………………… …............. …………….....2. 2. The lower lip of the calyx is almost smooth-edged, while the upper lip is deeply bipartite. The corolla varies from blue to white. Mediterranean……………….………… L. angustifolius L.
+ The lower lip of the calyx has 3 denticles, while the upper one is smooth-edged. The corolla is white or, less frequently, violet-blue or pink. Native in Balkan Peninsula, cultivated throughout Mediterranean and elsewhere.